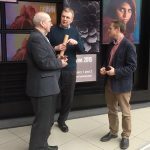 We recently made a very enjoyable trip to the National Media Museum in Bradford on the 28th March to see the wonderful Drawn By Light exhibition being held there from March 20th to June 21st. There are still a couple of weeks left in which you can visit this exhibition which contains over 200 exquisite images ranging from beautiful landscapes to haunting portraits. 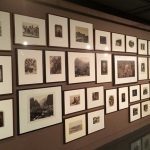 Founded in 1853, the Royal Photographic Society’s extensive collection is now held at the National Media Museum as part of the National Photography Collection. From this archive Drawn By Light gathers some extraordinary examples of the world’s oldest surviving photographic society, remarkable images taken by some of the greatest names in photography. 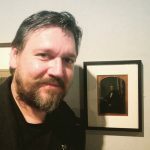 You will be able to see a number of the earliest known photographic images, dating back to the 1820s, as well as work by Roger Fenton and Julia Margaret Cameron, exhibited alongside contemporary works by Don McCullin, Terry O’Neill, Martin Parr and Steve McCurry. 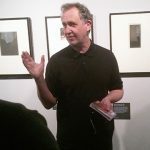 In addition to seeing the exhibition, we were lucky enough to catch talks and tour by Dr Michael Pritchard (director general of the RPS) and Colin Harding (curator for the History Group of The Royal Photographic Society of which John is a member). The Royal Photographic Society held their annual general meeting after the tour. 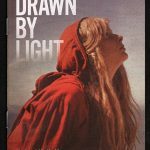 The Drawn By Light exhibition catalogue is available from The RPS at a discounted rate of £12 including shipping. This exhibition is highly recommended! Director General of The Royal Photographic Society Dr Martin Pritchard far left.